Located in the north-east corner of the campus, adjacent to woodland, the IF_DO-designed sixth form centre at St Teresa’s School, Effingham is the first phase of a 10-year masterplan. 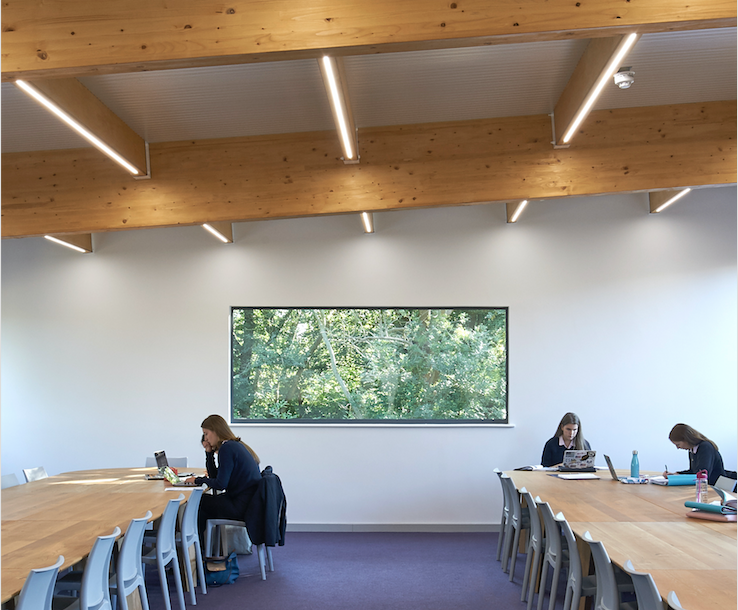 It aims not only to improve the school’s built fabric, but also to reconnect the primary teaching areas of the site to the natural landscape of the school grounds. Extensive scientific research has demonstrated that views of trees and greenery improve cognition and mental health, including a reduction in stress and improved educational performance. The plan identified the need for a new facility with smaller classrooms to accommodate a university-style teaching experience, enabling the sixth form to be a stepping stone to the next stage of pupils’ educational development. The brief called for a landmark building which would encourage existing pupils to stay on for the final two years, as well as attracting new pupils to St Teresa’s for their A-levels. The plan envisages a network of colonnades and courtyards, which stitch together disparate facilities on the campus. The building comprises two discrete blocks. The teaching block – the larger of the two – contains the classrooms, offices, common room and study room. The other houses the lecture theatre and is distinct from the other facilities to encourage access to all students. 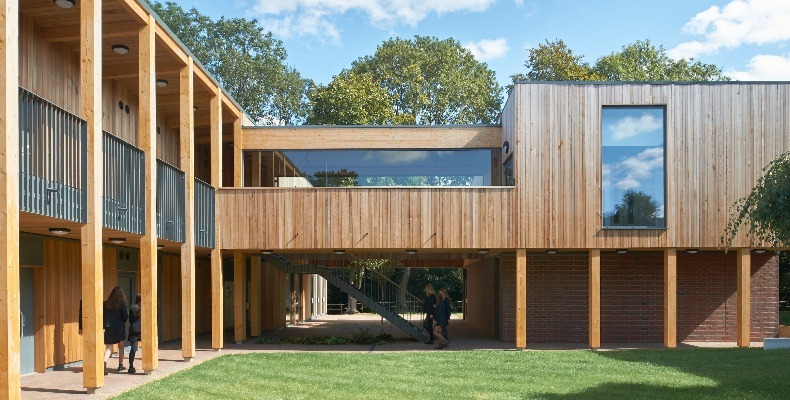 Nature pervades the entire scheme, from the formal courtyards to the outdoor woodland classroom, to the tree growing through the roof canopy at the centre of the plan. IF_DO director, Thomas Bryans, said: “This project has been pivotal for our practice, in that it has allowed us to further develop our ambition to deliver holistically sustainable buildings which have a wide-reaching impact. “Working closely with the St Teresa’s community, we have developed a design which not only meets the school’s brief and ambitions, but provides much more besides – from the excess energy that the building will produce, to the learning opportunities that the design and construction process has and will bring to the students. St Teresa’s Effingham is a selective, independent boarding and day school for girls aged 2–18 that was established in 1928. Latest EDQ magazine now available!